With a degree in Art from Auburn University as a start, Lucy has continued her pursuit of the love of painting and teaching as a career. She has established herself as an artist and leader in Augusta and the state of Georgia where she has worked to keep art an important part of community life. 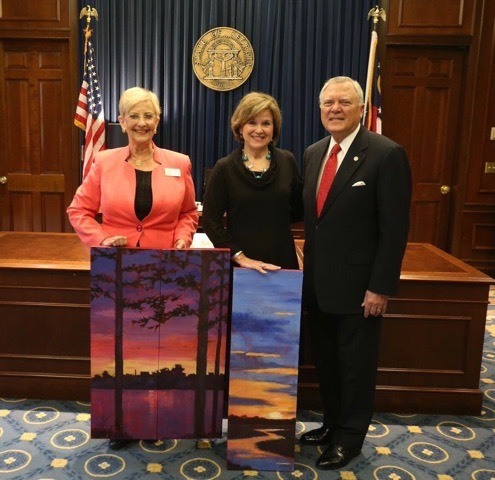 She has served on the Board of Trustees of the Gertrude Herbert Institute of Art, President and Signature member of the Georgia Watercolor Society, and Secretary and Signature Member of the Southern Watercolor Society. She is also Member of Excellence in the South Carolina Watercolor Society, the Atlanta Collage Society, Sacred Heart Cultural Center Guild, and Leadership Augusta. Lucy has received numerous awards for her painting locally and nationally, is included in private and corporate collections internationally, and was honored by her community by receiving the Woman of Excellence Award for her contribution to the Arts. She has been voted Best Artist by readers of Augusta Magazine and Columbia County Magazine. In 2005, four of her paintings were featured in the movie Diary of a Mad Black Woman. The paintings were leased from Abstein Gallery in Atlanta, where the movie was filmed. And in 2006, five paintings were leased for the film, Who’s Your Caddy, filmed in Aiken, S.C. Her painting, Angel Triumphant, was featured on the cover of the Nov./Dec. 2002 issue of The Upper Room magazine. Lucy works in oil and in mixed media, often combining acrylic and collage to create texture and pattern. I have been blessed with a God given talent and therefore, my works are dedicated to His Glory.